The trial of the killers of activist ‘International Solidarity Movement and journalist, freelancer, Vittorio Arrigoni, in Gaza killed on 14 April by a group of “Salafi”, has been postponed until October 20 . It ‘a process is not easy, because the murder and alleged murderers are still dense fogs. Investigation and trial phases is researching military court in Gaza, as some of the defendants were members of the military training “al-Qassam Brigades.” The September hearing was postponed to October 3 because the defense lawyer had claimed that the confessions were “extracted”, and therefore were not valid. Investigations and process environments and are used by some Italian media to direct rather serious accusations against the government of Gaza, in some blogs more or less clearly close to Zionism, however, the crime and the trial stage are used to create further confusion and false leads on the identity the instigators and perpetrators. 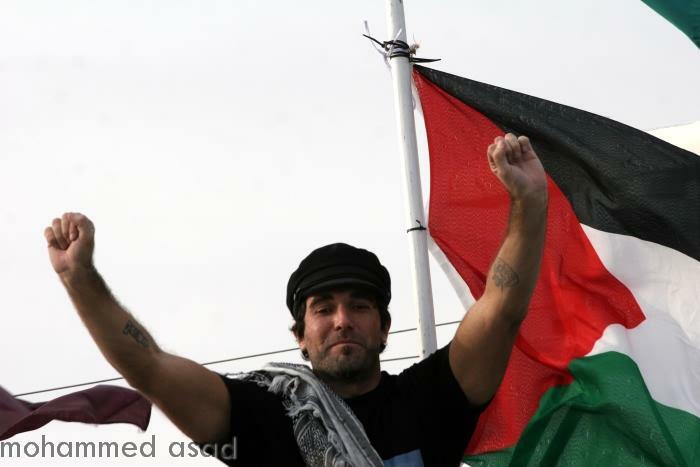 In recent months, Vittorio Arrigoni and the process of our mainstream newspapers and TV no longer speak. And ‘fell silent. The many friends of Vik-Utopia, his name of “battle”, always non-violent means, but do not forget him. His name and his slogan, which became famous around the world – “We are human” – read it anywhere, websites, facebook, blogs. The Freedom Flotilla 2, this summer, he was entitled: “Stay Human”, in fact. In recent days, we interviewed the mother of Victor, to take stock of the situation and to tell us his son, a hero-villain of the day. Mrs. Giles, q hat are your expectations and those of his family to the process being the murderers of his son? “We expect to know why Victor was killed. Because at that very moment. It seemed that they knew that Victor was about to leave Gaza. “The day of his abduction, we learned that the group that held him prisoner wanted to do an exchange with one of their leaders in prison, but usually the exchange can afford negotiating reality with a certain power. These, however, seemed unprepared for. “In any case, I’m interested in who was to kill my son and why. I hope that this truth comes out. I’m not complaining for postponements of the trial, because here in Italy we can not give lessons to anyone: our processes are very long. I did not hurry, do the time it takes, what matters is that justice is done. If those brought to court in recent weeks are innocent, look for other culprits. Network of newspapers and read many hypotheses about the murder of Victor. What do you think? “I do not make assumptions, I stick to what I say from Gaza. Why the ‘Jordan’ through the tunnels to go specifically to kill my son? “I ask myself many questions, since then, but I have no solutions. I really hope that those who led the investigation has gone to the bottom and has not found a culprit in the case. She never mentioned that he feared for his life? He had the impression that bother anyone? “I do not know if it bothered anyone. I do not ever talked. Lately I felt tired, but he had health problems. Someone raised the hypothesis that Victor may have been murdered for his efforts with Gybo . The result? “I do not think it was part of Victor. He will certainly have seen with joy the formation of that new reality, because he shared the anxiety of freedom of those guys who were protesting in the wake of the Arab revolution in progress. But from here to say that this was the reason he moved the hands of his murderers, there goes … Anyway, he had never spoken to me. “There is a total fog about her murder. I have confidence in the court that is conducting the investigation. “It’s hard for me to tell my son. … I could tell you many things Victor was Victor. We had a relationship of empathy and intense. We shared the same ideas and ideals. I said so often, I still have a text message sent on June 8 2009, for my re-election as mayor of Bulciago: ‘Mom, I am here and you there, but we share the same things away. We are following the same path.’ He told me that he was proud of me, and I had him. “From a young age, Victor was involved in labor camps and solidarity had begun with Peru, to 20 years. He was in Africa, Eastern Europe, Lebanon, West Bank and Jerusalem, then in Gaza. I in Palestine said that he had met the ‘sum of all the injustices’. He feared for his life? “They asked me if I regret the choices that Victor had done, if I go back in time and avoid everything … Victor is nourished by what he heard in the family, of what we did, and then chose, of his putting. “No, I do not regret anything. I suffer a lot, sure, but I can only say well done to Vittorio follow your road. “My son has helped to positively influence many people to wake up. His life was extraordinary. I do not know if he’d like to know who is considered a model, a hero, he was humble. It certainly has shaken the conscience.